Rapper Drake performs at the Coachella Valley Music & Arts Festival at the Empire Polo Club on April 12, 2015, in Indio, Calif. The Drake vs. Meek Mill beef seemed to reach an all-time high at the OVO Fest Monday night in Toronto. Drake performed both of his diss records aimed at Meek during Monday's OVO Fest while a bunch of memes mocking the Philly rapper played on a loop behind him on a jumbo screen. But it's not what happened during the concert that's garnering a lot of attention. It seemed more likely in Philadelphia, where I could see a knucklehead member of Meek's entourage who's fresh off the block and dying to prove his loyalty to Meek squeezing one off at Drake's camp in retaliation for this ongoing beef between the two rappers. But it didn't happen in Philly; it happened in Toronto, at the official after-party for the OVO Fest. A shooting broke out very early Tuesday, CP24 reports, resulting in a man and a woman being killed and three other people being wounded inside and near the Muzik nightclub. 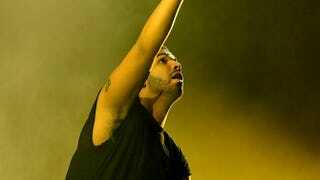 It is not known whether Drake was at the club at the time of the shooting. A Toronto official said that at least one of the individuals who was shot was an innocent bystander. Nor did the reports say the shooting had anything to do with the Drake-Meek beef, or with the heightened fever at the OVO Fest and, presumably, Toronto after Drake's controversial performance. All I'm saying is that I felt this kind of violence coming last night as I saw my timeline and newsfeed fill with the slander coming out of OVO Fest. I'm a hip-hop head. I love a healthy, lyrical beef every now and then. But I don't love violence. All I'm saying is that I miss Biggie. And Tupac.